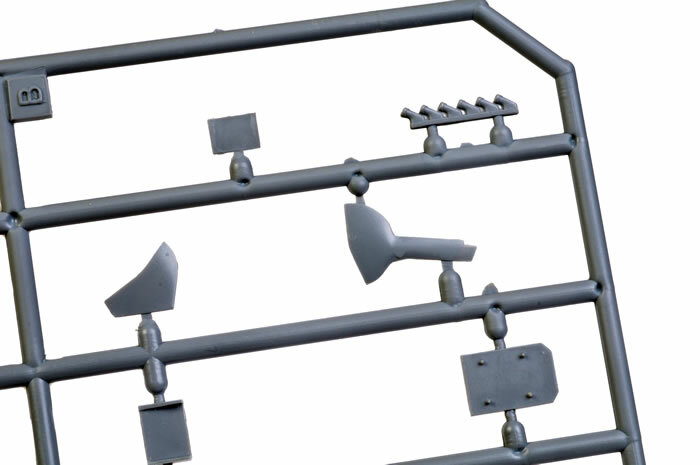 74 parts in grey plastic; nine parts in clear; markings for three aircraft. Advantages: Beautifully crisp recessed panel line detail; gull wing depicted; Mk.22 characteristics are all present; option of three spoke and four spoke main wheels; two-part canopy may be posed open if desired; simple parts breakdown means this should be a quick build for anyone familiar with limited run kits; high quality decals for three marking options with more to come! Disadvantages: Some minor flash; limited run nature of the kit means experience will be helpful. Conclusion: A straightforward and nicely detailed small-scale Spitfire Mk.22 with state-of-the-art surface features and excellent decals. Just be prepared to spend a little extra time on parts cleanup and alignment, and you will have yourself a lovely little late-mark Griffon Spitfire. The Spitfire Mk.22 and 24 represented the ultimate development of Supermarines's famous fighter. With a new powerplant, completely revised fuselage and different wing design, these final Spifires held very little in common with their Battle of Britain ancestors, but the family resemblence remained. 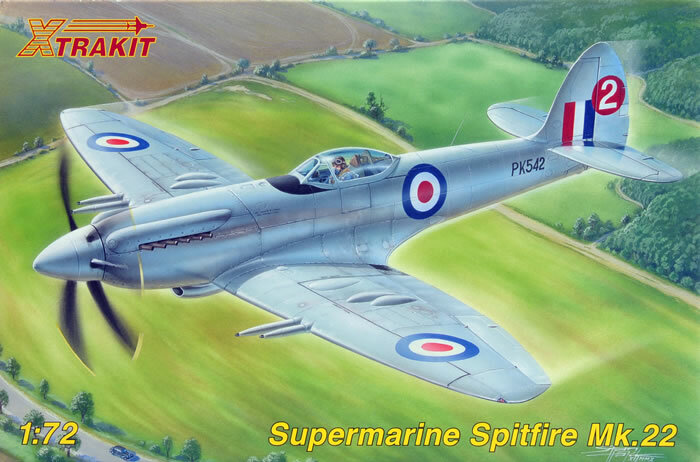 Xtrakit continues its commitment to neglected British aircraft with their brand-new 1/72 scale Spitfire Mk.22. This is a dedicated Mk.22, by the way, with the telltale radio hatch moulded in the correct position midway down the rear fuselage. No filling or inserts are required here. Similarly, only the Mk.22-style guns are provided in this release. 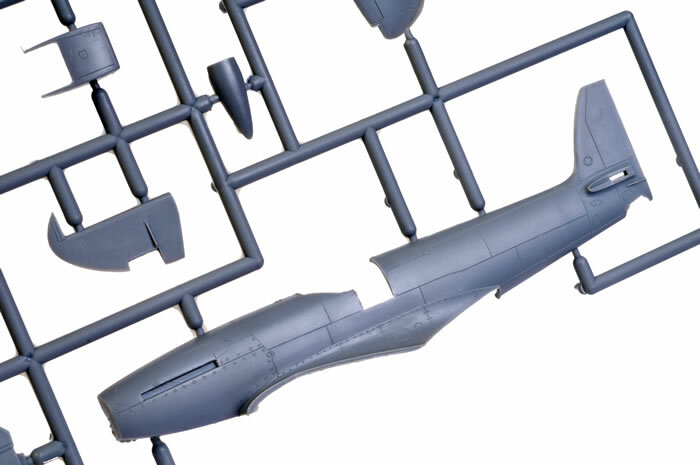 Xtrakit's 1/72 scale Supermarine Spitfire Mk.22 comprises 74 grey plastic parts on two sprues, and nine clear parts. The fuselage and wing surfaces feature really lovely crisp recessed panel lines and fastener circles where appropriate. This is a limited run kit. The surface features are state-of-the-art and detail is good, but you will not find locating pins on the main parts so you will need to take a little extra care with alignment. Also, some of the parts may have fine flash or raised pins interfering with mating surfaces. 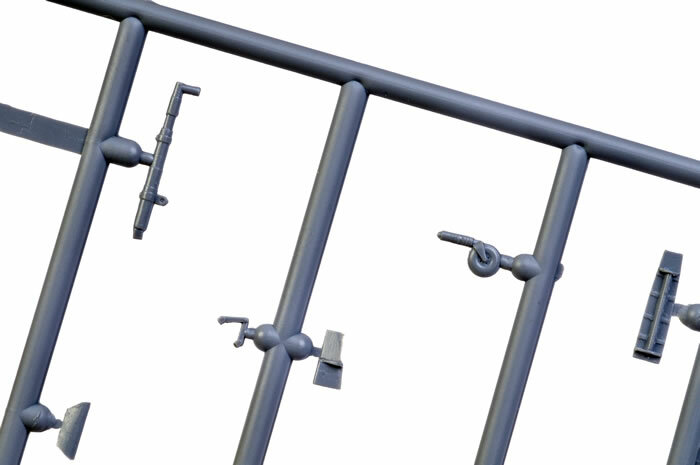 These are not a problem if you spend some time identifying them and removing the excess plastic before assembly. The cockpit looks good for an all-plastic small scale affair. Raised sidewall detail is moulded to the inside of the fuselage. The rear bulkhead, pilot's seat armour, the seat itself, control column and instrument panel make up the rest of the front office. Instrument detail is by way of raised circles. Dial decals are not provided. A solid plastic gunsight is supplied though. The cockpit door is a separate part, and that section of the port side fuselage is moulded open so no cutting will be required. The tubular exhaust pipes are solid at the ends. The big five-bladed propeller is mercifully a single moulding. The split rudder is broken down into top and bottom sections, while the split trim tab has been moulded with its bottom section offset - a nice touch. 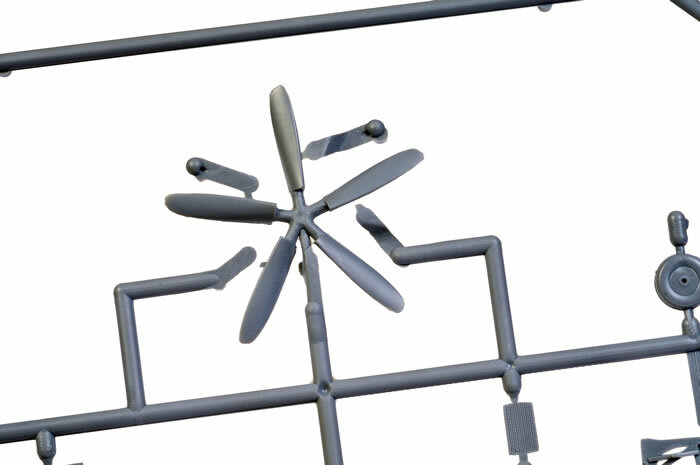 The ailerons, elevators and flaps are all moulded in the neutral positions. The gull wing effect looks good. Gun and wheel blisters are moulded onto the upper wing halves. The concave top of the wheel blister may be authentically viewed from underneath the wing, along with rib detail. The wheel wells are boxed in with four pieces on each side. This will look quite effective but test fitting is strongly recommended before you glue the top wing halves in place! A choice of three-spoke or four-spoke main wheels is offered. The clear canopy is moulded as windscreen and sliding section so that it may be posed open if desired. 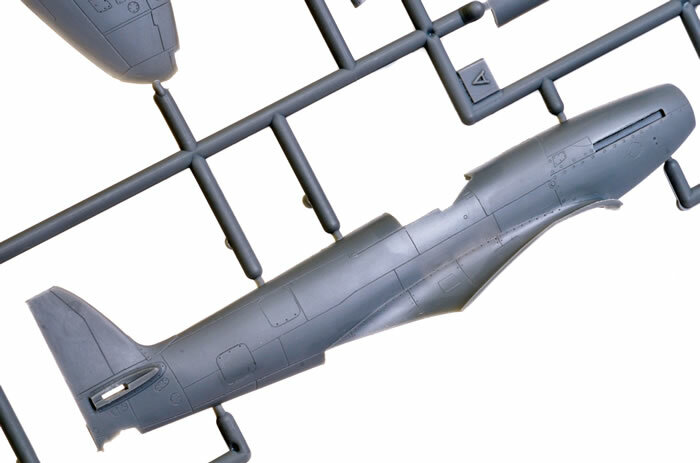 The clear parts also include a late-model Seafire windscreen. There are no rockets or other ordance supplied in this box. PK542, pilot J. Quill, Daily Express race - May 1951. Four variations in High Speed Silver and White. PK674/L, No. 73 Sqn. RAF, Ta kali, Malta finished in Dark Green and Ocean Grey upper surfaces with Medium Sea Grey underneath. PK331 RAT-E, No. 613 Sqn. Royal Auxiliary Air Force finished in Dark Green and Ocean Grey upper surfaces with Medium Sea Grey underneath. The decals, printed by Aviprint, are glossy and in register. Colours look good. We will be seeing eight more marking options very soon on Xtradecal's forthcoming decal sheet no. X72-128 too. 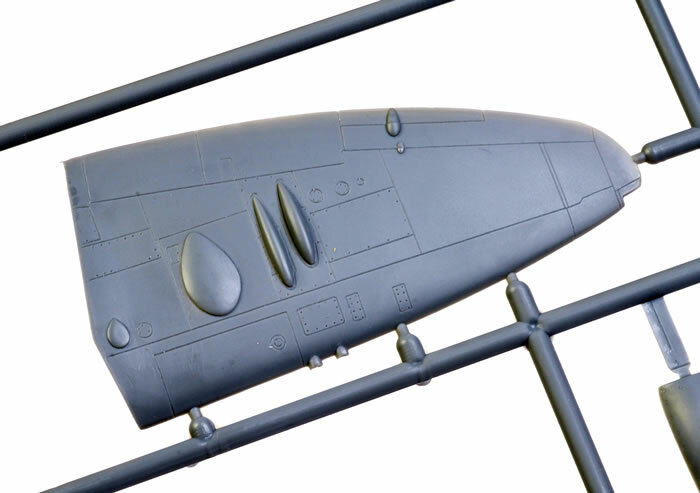 We have not exactly been bombarded with Spitfire Mk.22 models in 1/72 scale. Apart from the old and awful Hawk kit, we have had the option of low-pressure, short run kits from Pegasus and Ventura. Although Xtrakit's new Spitfire Mk.22 is technically a short-run kit, it is in a completely different category to these first generation short run kits. 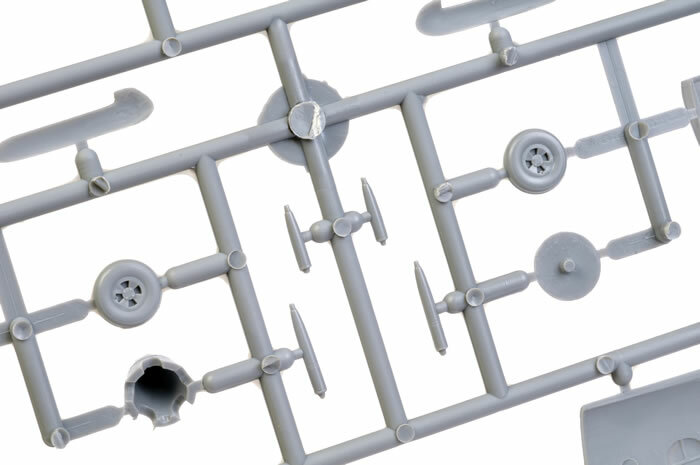 The Xtrakit Spitfire will be much faster and easier to prepare thanks to its relatively fine sprue attachments and clean mouldings. 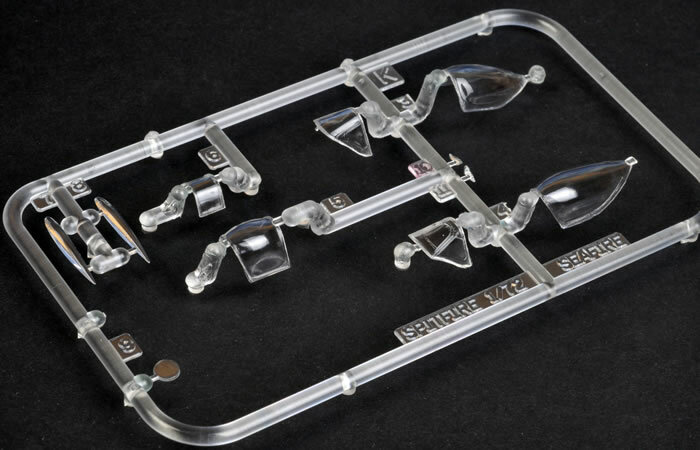 The pick in this scale would still have to be Czech Master Resin's exquisite model, but at £26.51, it is nearly three times the price of the Xtrakit offering. 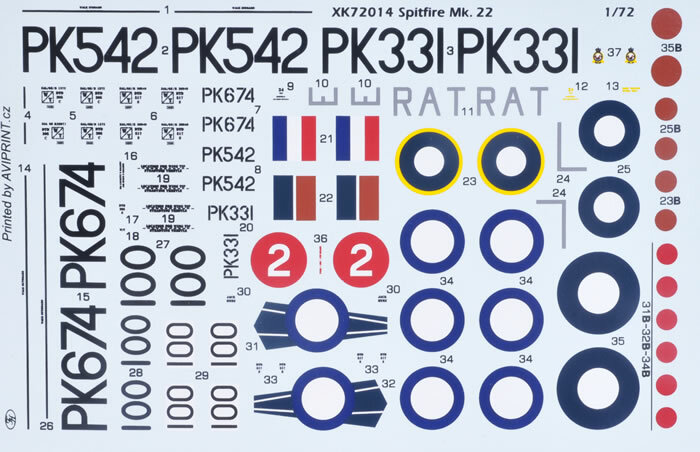 Xtrakit's Spitfire Mk.22 will be a very welcome addition to the lineup of Supermarine's famous fighter thanks to this sound value, nice detail and excellent surface features. Thanks to Hannants for the sample.